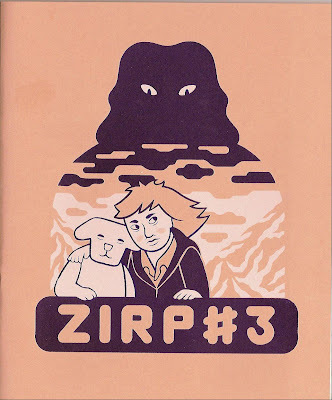 Zirp #3 by Till Thomas Issue three is a 28 page mini that switches gears from the last issue. In this installment, Rezzo, a cross between a dog and a teddy bear, and human Elizabeth endure a broken relationship that unfolds in a trailer. According to Till, this is the first part of an ongoing story. The story is in German, but he provides English translation numbered by panel at the bottom of each page. This makes it a bit difficult for an English reader to follow as your eyes travel up and down the page, but it’s a nice touch that it’s written in German and then footnoted in English. I ended up reading through the footnotes to get the gist of the story, and then followed the story panel by panel with the German. Most of the plot takes place through the art anyway. Till’s art is interesting. I like that his figures have a slightly tilted appearance on the page that reminds you of an old school scrolling video game. It’s a distinct style that lends to the type of story that he usually tells. Zirp number three is seven euros from Till’s website, but I also noticed copies at Rick Bradford’s Poopsheet Shop for seven dollars. Check out Till’s website for more info on his work. He’s doing freelance illustration work now and has a story in the latest Sturgeon White Moss.